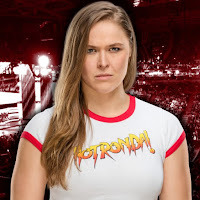 Ronda Rousey and Alexa Bliss rematched one another at a recent WWE live event in London, England. The match at SummerSlam only lasted four minutes. Rousey and Bliss doubled that in London. Last night a fan taped Rousey and Bliss’ full match at the WWE London live event, which lasted eight minutes long. Bliss actually got some offense in this time and gave Rousey a decent back-and-forth fight. When it was all said and done, however, Rousey locked in her signature Armbar and forced Bliss to tap out once again.